The kidneys are believed to be the most important organ in the human body in the fight against long-term fluoride exposure. 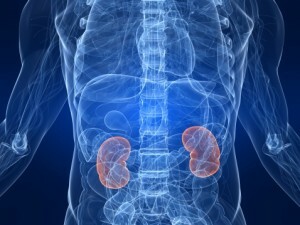 Healthy adult kidneys are able to excrete about 50 percent of ingested fluoride and are responsible for preventing toxic levels of fluoride from accumulating in the body. However, adults who have kidney disease excrete about 10 to 20 percent of ingested fluoride, which increases their body burden of fluoride and increases their likelihood of fluoride poisoning. In 1980, the National Kidney Foundation alerted physicians to monitor “the fluoride intake of patients with advanced stages of kidney disease,” as it is unknown how much fluoride is “safe” for people with kidney problems. There have even been several cases where people with kidney disease significantly recovered after beginning to use fluoride-free water. In 2006, a National Academy of Sciences (NAS) panel recommended that the Environmental Protection Agency’s safe drinking water standard for fluoride, set at 4 parts per million, should be lowered because of the evidence linking fluoride, at this level, to negative health effects in humans. A Chinese study found evidence of kidney and liver problems in children whose drinking water had as little as 2 parts per million of fluoride. Two parts per million of fluoride in drinking water is half of the level declared “safe” by the Environmental Protection Agency. The study’s authors noted that drinking water with fluoride levels of more than 2 parts per million can damage kidney and liver function in children. One study can’t give an absolute conclusion that fluoride can cause direct damage to the kidneys and liver, but several animal studies also show evidence to support this claim. In studies conducted on fluoride-exposed animals, kidney damage has been found at levels as low as 1 parts per million, if the animals consumed the water for a long period of time. This report has been produced by Assure a Smile, South Florida’s Home of Holistic Dentistry. For more information, readers are invited to visit the URLs in the Sources section below. Readers may also schedule an appointment with a holistic Miami dentist to learn more about the toxic side effects of fluoride.